Multi-platinum and award-winning country quartet Lonestar has released their new single “Maybe Someday,” currently spinning nationwide at country radio. The soaring and plaintive breakup song is available for purchase now on iTunes and will be featured on Lonestar’s forthcoming album Life As We Know It. Now set for release this spring on their own 4 Star Records in partnership with The Orchard, the new album marks the group’s reunion with original lead singer Richie McDonald. 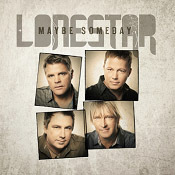 Watch the lyric video for “Maybe Someday”–written by the group’s Richie McDonald and Dean Sams along with songwriters Frank Myers and Billy Montana–here: http://www.lonestarnow.com/. The official music video for “Maybe Someday” was shot recently in Nashville and features the return of Sunny Mabrey (“Mad Men,” “Desperate Housewives,” “CSI: Miami”), the actress from the video for their massive hit “Amazed” (which can be seen here). The video will be released in the coming weeks. 2012 marked a big year personally and professionally for Longstar – Michael Britt, lead guitar & backing vocals; Richie McDonald, lead vocals & piano; Keech Rainwater, drums; and Dean Sams, keyboards and backing vocals–as they celebrated their 20th anniversary as a band and the return of McDonald. 2013 kicks up the excitement level with the release of the band’s new Life As We Know It album and a major nationwide tour. Look for Lonestar to perform at the Country Radio Seminar (CRS) in Nashville February 27. They’re also set to make their debut at Stagecoach: California’s Country Music Festival Sunday, April 28 where they’ll share the stage with the likes of Zac Brown Band, Darius Rucker, Thompson Square and others.